The Circuit Playground Express is a Swiss Army knife. Like its predecessor the Circuit Playground (now Classic) it has an accelerometer, ten Neopixel RGB LEDs, and other sensors on board making it easy to prototype many projects. The Express adds an infrared transceiver for communicating with other boards, but is much the same form factor as the Classic. What sets the Express apart is its 48MHz ARM Cortex processor which is six times as fast as the Classic. Adafruit uses this added power to expand your programming options. 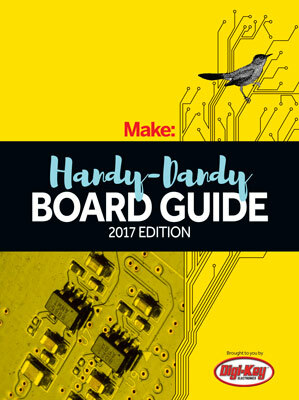 While the classic could only be programmed through the Arduino IDE or similar compilers, the Express adds MakeCode and CircuitPython, Adafruit’s port of MicroPython. This makes it a great tool for absolute beginner and advanced users. Neither MakeCode nor CircuitPython require drivers. You upload new code by dropping a file on a USB drive that appears when the board is attached to your computer. For absolute beginners, using MakeCode’s’ block-style programming environment is an easy way to get started. While still in beta, support for the Express’s sensors and outputs are functional and currently is Adafruit’s recommended way of programming the board. Unfortunately, Adafruit does not recommend using CircuitPython yet, as it is still in development, but hopefully it will offer some nice advantages. First is the REPL or read-evaluate-print loop. This allows you to write and update code live — a great way to try things out. CircuitPython also gives you access Python’s many libraries and even mix in low-level C/C++ code when needed. The Circuit Playground Express is a great board that will see beginners through many projects. When CircuitPython and Arduino support are added it will do the same for more advance users.